The BBC is running a new series – Astronauts, Do You Have What It Takes? - which, although it doesn’t yet have the cult following of The Great British Bake Off, already has my kids and I hooked. The show pits twelve highly educated contenders against each other in a series of mental and physical challenges with a view to endorsing the winner as an applicant to join a real space programme. Space veteran Chris Hadfield, former commander of the International Space Station, leads the selection team and, in the best tradition of Donald Trump, informs the weakest candidate each week that they’ll be leaving the group. Before introducing one of the challenges he told a story of how, when on the Space Station for the first time, he noticed a strange phenomenon. While taking notes with a simple pad and pen, he’d sometimes let go of the pen; despite it floating in plain sight in front of his face, it took him a surprisingly long time to locate it and grab it back. His brain found it difficult to accept that the pen wasn’t sitting on a hard surface as it would if he had dropped it while back on Earth. Hadfield’s observation was down to the way our brains function - they constantly fill in information gaps with predictions based on our life experiences (or at least how we remember them). As you read this article, your brain is predicting which letters, words and phrases come next before waiting to know for sure what I have written; we do the same when listening to people speak. As each of these micro-predictions turn out to be correct we feel small sensations of reward, tiny boosts of dopamine in our brain, which accumulate to create a general sense of comfort and wellbeing. It’s why, for example, we like rhythmic music - as we start to predict the music’s repeating pattern, and those predictions turn out to be right, our brain’s limbic system gives us a dopamine rush with every new beat. This evolutionary response is at the heart of our preference for certainty. For as long as our brain’s predictions keep proving correct, we remain on a dopamine fuelled high. When they prove to be wrong, however, the associated alert response feels much less comfortable. In effect, we haven’t just developed a preference for certainty, we crave it. We are hard-wired to prefer predictable environments. Just after this year’s UK election, the New York Times described uncertainty as the “new normal in western politics” – as anti-establishment sentiment and populism infuse the political zeitgeist, politicians, they argued, can no longer rely on old assumptions when campaigning. It’s not just politicians however that sense the sands shifting beneath their feet. Most people I talk to these days precede any serious discussion with something along the lines of “in these uncertain times…”. The political upheaval of the last two years, hot on the heels of the Global Financial Crisis, has left many people feeling deeply unsettled. More interestingly, however, it has left them hankering for the calm certitude they remember feeling just before these events happened. Logically, we were not of course in more certain times before the financial crisis or before recent political shocks - if we were then more people would have seen the current turmoil coming – but longing for the past after periods of rapid change is deeply rooted in our strong craving for certainty. When familiar, predictable patterns become broken and we come off the dopamine high, our instinct is to want them both back. Our craving for certainty is so strong, we can sometimes prefer predictable environments that don’t serve our best interests to less predictable ones that serve us better. A recent study by the UCL Institute of Neurology illustrates this well. Participants played a computer game in which they were asked to lift a series of rocks, some of which hid a snake; if they uncovered a snake, the participants were given a small electric shock. Peak levels of stress, measured by skin conductivity and pupil dilation, were observed not when the players expected an electric shock but when they figured out that exactly half the rocks had snakes beneath them i.e when there was a 50% chance of uncovering a snake and the participants were the least certain of the consequences of uncovering the next rock. Uncertainty about the outcome, it turns out, is much more stressful than a certain but bad outcome, in this case a snake under every rock and a shock every time the subjects lifted one. The predictability promised by financial theory and practice, before the crisis and still today, naturally appeals to our inherent cravings but it may be one of those situations where our certainty preference is working against our best interests. The dominant school of thought in finance, essentially a mathematical model of Adam Smith’s “invisible hand” working in capital markets, sits well with the human need for surety. The Efficient Markets Hypothesis, Modern Portfolio Theory and the Capital Asset Pricing Model all accept that we can’t predict the future but inform us we can model it – we can at least determine the probability of outcomes with great precision. In effect, they leave us feeling that we can control our exposure to unknowns rather well. It’s now widely acknowledged, of course, that the intellectual framework is flawed. An enormous body of evidence, and common sense, make it clear we cannot model the future in the way the theory claims. The simple problem is that it models the known unknowns but not the unknown unknowns. The unknown unknowns however, good or bad, are simply too big to ignore. Despite this fundamental flaw; financial advisors plot their clients’ tolerance for risk on hypothetical curves and trade-off future returns for the security of “risk free” assets; actuaries model the future liabilities of pension funds for their trustees and managers to lock-in, to seek certainty in, their ability to meet them; armies of analysts build hypothetical forward looking financial models for their sales colleagues to sell as if they are fact. Growth in the number of financial instruments promising to mitigate wholesale risk has been exponential - the global market for Credit Default Swaps, insurance against debts turning sour, is now seven times bigger than global GDP. Most crucially, the largest asset class of all, sovereign bonds, is still sold as the safest investment around, despite offering negative real returns. A reliance on Modern Financial Theory (theory that is sixty years old) has left today’s financial industry more focussed on selling the perception of certainty than spreading risk and the returns that risk-takers receive. For savers and investors, the outcome is an unhealthy collective relationship with financial uncertainty that has left most people without risk assets and, by definition, without a stake in the returns to them. From a societal perspective, our natural preference for certainty got the better of us; a finance industry built on selling the perception of more certainty has left most people, perversely, with less of it. Humans are storytellers by nature. Anthropologists argue that it is our ability to tell stories, particularly fiction, that separates us from other species. In his History of Humankind, Yuval Noah Harari argues that it is this ability to tell (make up) stories that allowed bigger groups to form, it meant social structures could be built on ideas and proliferate without everyone directly knowing the storyteller. The “story”, according to Harari, might be the foundation of a religion but it could just as easily be the start of a nation or the development of a limited liability company. Financial markets inherently lend themselves well to storytelling. A fast-moving environment, steeped in emotion with a big impact on people’s lives makes it rich pickings for anyone wanting to spin a yarn. For investors, however, stories may play a deeper role than we think. As professor of psychoanalysis and protagonist of the emerging school of emotional finance, David Tuckett, points out, “narratives provide the vocabulary of meaning to support and legitimate action and to deal with misfortune”. We tell ourselves stories to keep ourselves going. In particular, we have an innate ability to create narratives to reassure us when things don’t turn out the way we thought they would. Moreover, the more profound the difference between prediction and outcome, the more entrenched our narratives - our stories – tend to become. Numerous studies, usually involving strong religious believers, have shown how the reaffirmation of pre-existing beliefs can allay the anxiety brought on by feelings of uncertainty. The more the world feels unpredictable the more we cling onto dogma – as a recent study published by the British Psychologic Society put it, “Dogmatic beliefs reduce complexity of life and create a psychologically safe, predictable environment” . It’s not just religious beliefs, however; our yearning for predictability might also explain why, post the referendum, attitudes on both sides of the Brexit debate have hardened and it might explain why, after the Global Financial Crisis, many in finance cling even harder to their old models and theories. For professional investors, the storytelling instinct can often lead to too much time spent foretelling an unknown future, often supported by forward looking financial models which further harden the narratives used when the models turn out to be wrong. Moreover, the growing pressure to publicly make the case for specific investments can make it even harder to respect and deal with a different outcome to the ones publicly foretold. We can become trapped by our flawed narratives. Similarly, the instinct can predispose private investors and savers, who often rely on professionals, to stay with advisers for longer than would otherwise make sense. The advice, the products and the beliefs that underpin both can keep the dopamine flowing for much longer than their financial interests might be best served. 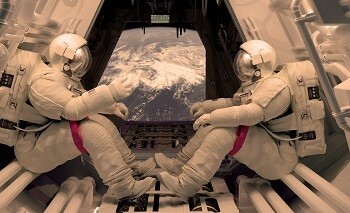 Astronauts love telling stories and generally they have much better ones to tell than those of us who work in finance. Leap of Faith – An Astronaut’s Journey into the Unknown by Gordon “Gordo” Cooper is one of the more thrilling. Cooper was one of the seven astronauts on the Mercury programme in the early sixties, he was in fact the pilot on Mercury’s longest and final mission which orbited the Earth twenty-two times in thirty-four hours during the summer of 1963. Close to the end of the flight, minutes after Cooper had said prayers of thanks for the opportunity to fly on the mission, an unexpected power failure on the Faith 7 capsule looked like ending it in disaster. With rising carbon-dioxide levels and temperatures above 100 degrees Fahrenheit, he used his understanding of star patterns, his wrist-watch and lines on the capsule window to manually guide the craft safely back to Earth. No-one could have predicted the series of events that led to Faith 7’s automated control system going wrong – in financial theory speak, it was a series of unknown unknowns. But quick reactions by Cooper and the Mercury Control Centre, as well as a flurry of cross-checking and diagnostics, led to a rapid re-writing of the story - in astronaut speak, a revision of the re-entry checklist. The old story (check-list) was forgotten within the last, extremely fast, orbit of the Earth. In the early years of space flight, astronauts were required to be good jet pilots and be less than 5 feet 11 inches tall. By the mid-sixties, NASA began to look for scientists to send into space, Doctorates in Physics and Biology became the norm. As crews became bigger; leadership, teamwork and communications skills became more important. As missions are now expected to be longer, especially given a potential mission to Mars within the next few decades, NASA are starting to focus on what it takes to survive a long, highly unpredictable trip; with poor communications, cramped accommodation, long periods of inactivity punctuated by short burst of activity and, almost certainly, the occasional misfortune. Dr. Mark Shelhamer, who ran NASA’s Human Research Program, describes the most important attribute for astronauts on these long missions as “the ability to adapt to changing circumstances and recover from perturbations”; the ability to cope with anomalies, deal with emergencies and bounce back from injury will define the next generation of astronauts. In the recent episode of Do You Have What It Takes? Commander Hadfield, mindful of his difficulty grabbing his pen in space, set his BBC candidates a simple task; to sign their name on a whiteboard. The only complication was that they were asked to do it while wearing glasses which turned the world, as they saw it, upside down. He was testing their ability to function in a world that wasn’t the one their brains naturally predicted. Our ability to adapt, it seems, largely depends on us not being held back by previous predictions of how things might or should pan-out. The way an astronaut is expected to deal with uncertainty, the unknown, offers a valuable lesson for professional and private investors alike. We must consider as many scenarios as we can and make sure, as much as possible, that we and our clients can survive them. Beyond that, we shouldn’t get too hung up on what we expect – things will almost certainly turn out differently. The fear that uncertainty creates can often stop us embracing it to our advantage but, as Commander Hadfield says, “you should have fear of some things, that doesn’t mean it incapacitates you from your ability to figure out a way to deal with it”. Andrew McNally, Chief Executive Officer at Equitile Investments Ltd. The gross notional amount of Over the Counter (OTC) Credit Default Swaps in December 2014 was $563.29 trillion according the Bank of International Settlements. Global GDP in 2014 was $78 trillion. Sapiens, A Brief History of Humankind. By Yuval Noah Harari. Harvill Secker, September 2014. Harari tells the story of Peugeot to illustrate this point. Minding the Markets: An Emotional Finance View of Financial Instability. David Tuckett. AIAA, May 2011. Many faces of dogmatism: Prejudice as a way of protecting certainty against value violators among dogmatic believers and athiests. Malgorzata Kossowska et al. British Journal of Psychology, 19 February 2016. Leap of Faith – An Astronaut’s Journey Into the Unknown. Gordon Cooper with Bruce Henderson. Mass Market Paperback 2002. John Glenn, himself one of the Mercury 7 and later a US Senator, was on one of the Mercury Tracking ships and re-wrote the re-entry checklist with Cooper.